In A Sense of the Resurrection: An Easter Experience for Families, each activity focuses on one of the five senses–for example, smelling the perfume Mary used to anoint Jesus’ feet, hearing the rooster crow after Peter’s denial. 3. The activities are not just crafts–they are big memory-makers (like making bread for the Last Supper) or what I like to call “memorials” where you make a craft-project that transforms your home (like making sparkly window catchers to remind you of the bright angel who rolled Jesus’ stone away). We are going to be working through these activities in my house this Easter season! If you’re interested, you can get a copy of the book here, plus get 20% off when you enter coupon code HOMEBLESSINGS at checkout! 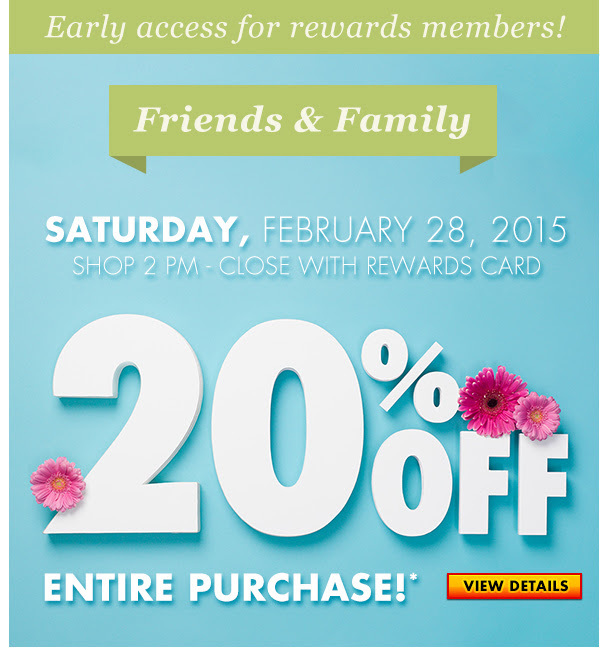 This weekend (Feb 28 & March 1) you can get 20% off your entire purchase at Big Lots! You’ll need a frequent shopper card on Saturday, but they’re free and you can get one easily at the register. On Sunday you’ll need the printable coupon you can find here! Go here for more info on the sale. This is an especially great opportunity to get a 20% discount on food items! Saturday, Feb. 28th from 8 a.m. – 2 p.m. there will be a children’s consignment sale at Heritage High School inside the main entrance commons area. All proceeds will benefit the Heritage Winter Guard team’s fund for competition travel expenses. This is a cash only sales event. Sale items will include children’s clothes, shoes, toys, books, CDs, DVDs, and more. Giveaway: win tickets to the Junior League’s 2015 Bag-A-Bargain rummage sale! UPDATE: The winners are #24 Lindsey S., #34 Nina S., #21 Sarah M., and #7 Lynette W. Thanks so all who entered! I am proud to be a Sustaining Member of the Junior League of Knoxville. I joined the Junior League in 2002, and have thoroughly enjoyed my League experience. My favorite event every year is Bag-A-Bargain, the giant rummage sale for which the League is famous! This year’s Bag-A-Bargain sale will take place on Saturday, March 7 from 8 a.m. to 1 p.m. at the Jacob Building in Chilhowee Park (near the Knoxville Zoo). This giveaway ends Wednesday, February 25 at midnight EST. I will choose 4 winners via random.org and will post their names on Thursday, February 26. Giveaway open to US readers only. Allegiant Air presidential deals: $49 flights to Orlando! Allegiant Air has a special sale going on that includes $49 flights to Orlando. Doesn’t that sound fantastic right now?! Go here to see all the deals. American Girl doll SUPER SALE: historical dolls for $55, accessories, more! If you have a daughter who loves American Girl dolls, you won’t want to miss today’s Jill’s Steals & Deals sale! The code JILLSFEB will get you the following deals, but if you’re interested, HURRY, as these sell out SO fast!! This sale starts at 8:00 a.m. EST. The Appalachian Ballet Company will present the ballet Cinderella March 6-7. After the March 7 show there will be an additional event where children can meet the characters from the ballet, and tickets for that event are $10/child (adults free) with a limited number of tickets sold. To purchase tickets now during the presale, go here and use code CINDERELLA. You may also purchase tickets by calling the ABC at 865.982.8463. 20% off my VERY favorite planner (2015-2016 version) through March 31! The Well-Planned Day is my absolute FAVORITE daily planner, and it’s on sale right now for 20% off! Last year I ditched my electronic planners and decided to go back to a paper planner, and it has been SO much better! This is the specific planner I use; it runs from Summer 2015 – Summer 2016, and while it’s specifically targeted at homeschooling parents, I think it would work well for afterschoolers or really anyone who has kids and needs to keep track of all their activities! It’s on sale for 20% off through March 31. You can actually take a look through the pages when you visit the website here. If you’re more of a calendar year planner as opposed to a school year planner, you’ll like this 2015 planner which is 50% off TODAY ONLY! February 20 – March 8 there are a number of Pigeon Forge and Gatlinburg attractions that will be offering free or discounted admission to teachers or homeschool parents. See above flyer for details. TN grant program: get $500/year free for your child’s college savings account! The State of Tennessee has a program called Tennessee Investments Preparing Scholars (TIPS) that helps lower- to middle-income families save for college by providing a 4:1 match for those who qualify. (A family of 4 making $58,875 or less annually will qualify!!) Contribute $125 between now and June 30, 2015 and get $500 added to your child’s TNStars account. You can do this for the next three years for a total of $1500 free for your child’s college savings! If you don’t have a savings account, you can open one up when you apply. Visit the TIPS website here for more information. This is such a great opportunity!